Advance Baiting: It is unlawful to deposit any meat, bones, dead fish, or other food material in inland waters for the purpose of luring fish. However, it is lawful to place food particles in a baitfish trap for the purpose of luring baitfish (Title 12, §12657). Bag Limit (All Fish): Any fish, except baitfish and smelts, taken from inland waters shall be immediately released alive into the water from which it was taken, or killed at once. Any fish killed becomes part of the daily bag limit (Title 12, §12611). Bait Containers: A person selling bait may not provide or sell the bait in containers composed in whole or in part of polystyrene foam plastic. This does not apply to baitfish (Title 12, §12553-2). Closed Waters: All inland waters, including those in Indian Territory, are closed to ice fishing except those opened by rule (Open Water Fishing – Title 12, §12453, Ice Fishing – Title 12, §12454). Cusk Lines: All lines set through the ice at night (sunset to sunrise) for cusk must be checked at least once every hour by the person who set them (Title 12, §12659-A-4). Any resident 16 or 17 years old in the custody of the Dept. of Health and Human Services (Title 12, §10853-16). Any person or entity that allows a group of persons with disabilities to fish in a location for a period of time as specified on the license (Title 12, SS10853-17). Complimentary License Holders:Complimentary license holders eligible to fish in S-9 waters includes all of those listed under the Complimentary Fishing License Provisions above except item 2. Failure to Label Fish: It is unlawful to keep bass, landlocked salmon, togue (lake trout) or trout at any sporting camp, hotel, public lodging place or any place other than a person's residence without attaching the name and address of the person who caught the fish (Title 12,§12608). Fishways: The area within 150 feet of any operational fishway is closed to fishing. For purposes of this subsection "operational" means a fishway capable of fish passage whether or not it is allowing the passage of fish at any given time). Note: These provisions do not restrict the taking of alewives and smelts in accordance with laws regulating marine resources (Title 12, §12457). Exceptions: Any fishway exceptions are noted in the special fishing laws section. Fly Fishing: No more than 3 unbaited artificial flies individually attached to a line may be used. (Title 12, §12654-A). Note: Note: It is unlawful to troll a fly in waters restricted to fly fishing only (Title 12, §12658). Free Fishing Days: Will take place on February 16-17, 2019 and June 1-2, 2019. On these days, any person (except those whose license has been suspended or revoked) may fish without a license. All other laws and regulations apply on these days (Title 12, §12503-3). Must remove the shack or structure 3 days after the close of the ice fishing season or prior to ice out, which ever date comes first (Title 12, §12661). Shall identify on the outside of the shack or structure in 2-inch letters, the owner's name and address when the shack or structure is on the ice of any inland waters (Title 12, §12661). A person may not leave a structure on another person's land without permission of the landowner (Title 17, §2263-A). A landowner may immediately remove or destroy a structure left on their property and may recover the costs associated with doing so (Title 12, SS12661). Illegal Fishing: Except as otherwise provided, it is unlawful to fish other than with a single baited hook and line, artificial flies or artificial lures and spinners. Exception: This does not apply to hook and line smelt fishing (Title 12, §12654). All other rules and regulations governing the taking of smelt apply. Use of gaff is unlawful (Title 12, SS12656). Illegal Use of Antifreeze: Adding substances containing ethylene glycol or other antifreeze agents to waters of this State is illegal (Title 38, §413). A. Except as otherwise provided, it is unlawful to possess any grapnel, trawl, weir, seine, gill net, trap, set line or drop net on or adjacent to any of the inland waters of this State. B. Except as otherwise provided, it is unlawful to fish with a grapnel, spear, spear gun, trawl, weir, gaff, seine, gill net, trap, or set lines (Title 12, §12656). Importation of Fish: It is unlawful to import any live freshwater fish or eggs into this State without written permission from the Commissioner (Title 12, §12509 & Title 12, §12556). Lead Sinkers: is unlawful to sell, offer for sale, or use a lead sinker that weighs 1 ounce or less or measures 2.5 inches or less. This does not include artificial lures, weighted line or lines, or jig heads. It is unlawful to sell, offer for sale, or use an unpainted bare lead jig that weighs one ounce or less or measures 2.5 inches or less (Title 12, §12663-B & Title 12, §12664). 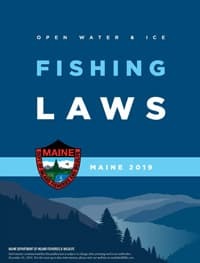 Line Restrictions: Unless otherwise provided by rule, the number of lines an angler may fish at any one time is limited to two lines while open water fishing (Title 12, §12652) and five lines while ice fishing (Title 12, §12659-A). At no time may an angler fish with more than five lines. Litter: It is unlawful to dispose of litter (including abandoned ice fishing shacks) anywhere in this State, except in areas or receptacles designed for that purpose. Convicted violators face fines up to $500 for the first offense and up to $2,000 for subsequent offenses (Title 17, §2264-A). Marking Fish: It is unlawful to tag, fin clip, or otherwise mark any fish to be released alive into the inland waters of the State without the written consent of the Commissioner (Title 12, §12601). Night Fishing: Except as otherwise provided by rule, all waters open to fishing are open to fishing 24 hours a day. All lines must be under the immediate supervision of the person who set them (Open Water Fishing - Title 12, §12652, Ice Fishing - Title 12, §12659-A). Exception: All lines set through the ice at night for cusk must be checked at least once every hour by the person who set them (Title 12, §12659-A-4). Notice of Submerged Vehicle: The owner of any motor vehicle, all-terrain vehicle or snowmobile that becomes submerged, or partially submerged, in the waters of the State shall immediately notify the Commissioner of Inland Fisheries and Wildlife of the event and the location of the vehicle. The owner is legally liable for removal and to pay any damages resulting from the submersion or removal. Motor vehicles shall be removed within 30 days (same day if public water supply). Snowmobiles and ATVs shall be removed within 24 hours (Title 17, §2267-A). Possessing Gift Fish: A person who does not possess a valid fishing license issued under chapter 913 may not possess a fish or any part of a fish given to that person except a person may possess in that person's domicile a gift fish that was lawfully caught and is plainly labeled with the name of the person who gave the fish and the year, month and day the fish was caught by that person. This section does not apply to baitfish (Title 12, §12613). Possession Limit (All Fish): A person shall not possess at any time more fish than may lawfully be taken in one day (Title 12, §12602-2). Railroad Track Restrictions: A person may not, without right, stand or walk on a railroad track or railroad bridge or pass over a railroad bridge except by railroad conveyance. For penalties see Title 23, Chapter 611, § 7007. Removal of Heads and Tails: It is unlawful to alter the length of landlocked salmon, trout, togue, lake whitefish, and bass unless the fish are being prepared for immediate cooking. It is unlawful to possess or transport fish dressed in such a manner that the species of fish cannot be identified; unless the fish are being prepared for immediate cooking (smoking does not constitute cooking) (Title 12, §12601). River Herring: A licensed fisherman may harvest up to 25 river herring (for consumption by that person or members of their family) by use of hook and line or dip net (Title 12, �12506 -5-A). Sale of Certain Fish Prohibited: It is unlawful to buy or sell, directly or indirectly, trout, togue, landlocked salmon, bass, white perch, or pickerel (except fish which have been lawfully produced by commercial producers and skins of fish which have been preserved by taxidermy) (Title 12, §12609-A). Salmon Eggs As Bait: Commercially prepared eggs from species that do not naturally occur in this State may be used for bait (Title 12, §12553). Season Dates: All dates are inclusive. Smelting: Unless closed by rule as indicated within the Special Regulations Section a person holding a valid Maine fishing license may take smelts for recreational purposes only from the inland waters or portions of inland waters that are naturally free of ice with a dip net in the usual and ordinary way from noon to 2:00 a.m. in accordance with bag limits established by rule. Bag limits established by rule under this paragraph are for a 24-hour period, beginning at noon on a given day and ending at 11:59 a.m. the following day. A person may not take smelts with a dip net unless it meets the requirements listed under the dip net definition (Title 12, §12456). A dip net when used to take smelts in a tributary or within 100 feet of the mouth of a tributary must contain a rigid circular frame that is not more than 24 inches in diameter as measured at any point on the hoop and manually operated by a single person (Title 12, §10001-12-A). It unlawful to alter smelts (including removal of head, tail or innards) from their natural state until a wet measure has been conducted. Note: An unlimited number of baited hooks may be used on your line while fishing for smelts. Snagging: It is unlawful to fish for any fish, except suckers, by snagging (Title 12, §12651 & Title 12, §12602). Suckers: Persons licensed, or otherwise entitled to fish, may take suckers for their own use between April 1st and June 30th from all rivers, streams and brooks open to fishing by use of a hand spear, bow and arrow or by snagging. Note: If suckers are taken by bow and arrow, the arrow must have a barbed or pronged point and must be attached to the bow with a line (Title 12, §12506-7). Exception: All lines set through the ice at night for cusk must be checked at least once every hour by the person who set them (Open Water Fishing - Title 12, - §12652, Ice Fishing - Title 12, §12659-A, Cusk Fishing - Title 12, §12659-A). Ten-Acre Ponds: All ponds of 10 acres or less, whether the pond is natural or artificial, formed on rivers, streams and brooks are governed by the same fishing laws that apply to the river, stream, or brook where the pond is situated (Title 12, §12451). Note: This does not apply to private ponds. Exception: If a lake or pond is in the alphabetical waterbody list of the Special Fishing Laws section then lake and pond general and special laws apply. Use of Explosive, Poisonous or Stupefying Substance: It is unlawful to take or destroy any fish by use of an explosive, poisonous or stupefying substance (Title 12, §12653). Use of Fish (live or dead) as Bait: See laws concerning the use of baitfish (live or dead). Violation of Limits: It is unlawful to fish for or possess fish in violation of the number, amount, or size limits of any rule adopted by the Commissioner (Title 12, §12602). Artificial Lure: Any fishing lure constructed by humans as an imitation or substitute for natural bait or fish forage and includes, but is not limited to artificial flies, spinners, spoons, poppers, plugs, jigs and plastic, rubber or other artificial imitations of natural bait (Title 12, §10001-4). An artificial lures only rule prohibits the use of any live, dead or chemically preserved natural or organic bait or food (Title 12, §12655). Bass: The term "bass", when used alone, includes largemouth and smallmouth. Brook Trout: The term "brook trout" includes brook trout, splake, and Arctic char (Sunapee trout and blueback trout). Dip Net: A device consisting of a rigid frame filled with netting, firmly attached to a rigid handle and manually operated by a single person (Title 12, §10001-12-A). Fly Fishing: Casting upon water and retrieving in a manner in which the weight of the fly line propels the fly (Title 12, §10001-27). General Fishing Law: General Fishing Law is defined as laws and rules that govern fishing in all water bodies unless there are other more specific regulations listed. More specifically, general law covers any legal terminal gear, daily bag and possession limits, season dates and species. See General Fishing Law provisions. Hook: A single fish hook constructed with 1, 2 or 3 points (Title 12, §10001-30). See single -baited hook definition. Ice Fishing: Taking freshwater fish during the ice fishing season through man-made openings in the ice by the use of ice fishing implements. It is unlawful to open water fish in inland waters while positioned on ice (Title 12, §12601). Ice Fishing Implement: Any lawful fishing implement used to take fish through the ice including a trap (tip-up), jig stick, rod in hand or handline, except that a person engaged in taking smelts and baitfish may do so in accordance with the laws and rules governing these activities. Ice Fishing Trap (Tip-Up): An ice fishing implement for storing line, designed to be set through the ice and to indicate when something has disturbed the attached bait. Minimum Legal Length: The total length of a fish measured from the tip of the snout to the tip of the tail, with the lobes of the tail squeezed together (Title 12, §12601). Open Water Fishing: Taking freshwater fish during the open water fishing season by means of hook and line in hand, or attached to a rod, or by casting or trolling artificial flies, lures, or baited hooks, provided that the person angling does not take fish through a man-made hole in the ice, from the ice or from any object supported by the ice (Title 12, §12601). If a full-time student at a Maine college or university, resides in Maine and satisfies above requirements. Nonresident means a person who does not fall within the definition of a resident (Title 12, §10001-53). Salmon: The term "Salmon", when used alone, means the same as landlocked salmon (Title 12, §10001-54). Set Line: A line extending into the water and rigged to catch fish that has one end secured to the shore, or to a fixed or buoyant object, that is not personally attended (Title 12, §10001-56). Single-Baited Hook: A single-baited apparatus designed to catch only one fish at a time (Title 12, §10001-57). See Hook definition. Snagging: To fish by manipulating a hook or hooks in such a manner as to pierce or snag the fish in a part of the body other than the mouth (Title 12, §10001-58). Terminal Gear: Tackle at the end of a line used to catch fish, including baited and unbaited hooks, artificial lures and baits, and artificial flies. To Fish: To take, catch, kill, molest or destroy any fish or to attempt to take, catch, kill or molest or destroy any fish (Title 12, §10001-23). Togue: The term "Togue" means the same as Lake Trout. Tributary: A river, stream, or brook flowing directly or indirectly into a lake, pond, or another river, stream, or brook. A lake or great pond shall not be construed to mean tributary. The tributary to a great pond shall not be considered a tributary to the outlet of that great pond (Title 12, §10001-66). Troll: To fish by trailing a line rigged to catch fish behind or in front of a watercraft being propelled by mechanical, wind or manual power (Title 12, §10001-67). Note: Tandem flies are allowed when trolling. Trout: The term "trout" when used alone, includes brook trout, brown trout, rainbow trout, Arctic charr (Sunapee trout and blueback trout), and splake.